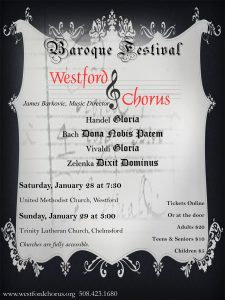 For this concert, the Westford Chorus presents Baroque Festival, a program of early 18th Century masterworks for chorus, soloists and orchestra by J.S. Bach, Handel, Vivaldi and Jan Dismas Zelenka. Sit back, Click a selection below, and enjoy your musical journey "back to the Baroque"
Click to listen to a movement.